Lesson Three for the Dippity Doo workshop I'm taking is to create texture using a variety of stitches .... which I did!. Quite a fun step and the options could be limitless. I think that I could have added a whole lot more, but want to see what the rest of the adornment steps are so I have appropriate space. It's the Salt line of thought. You can always add more, but you can't take it away. Suppose that doesn't really apply, I just dislike removing stuff ... from my Corporate America days ... rework. 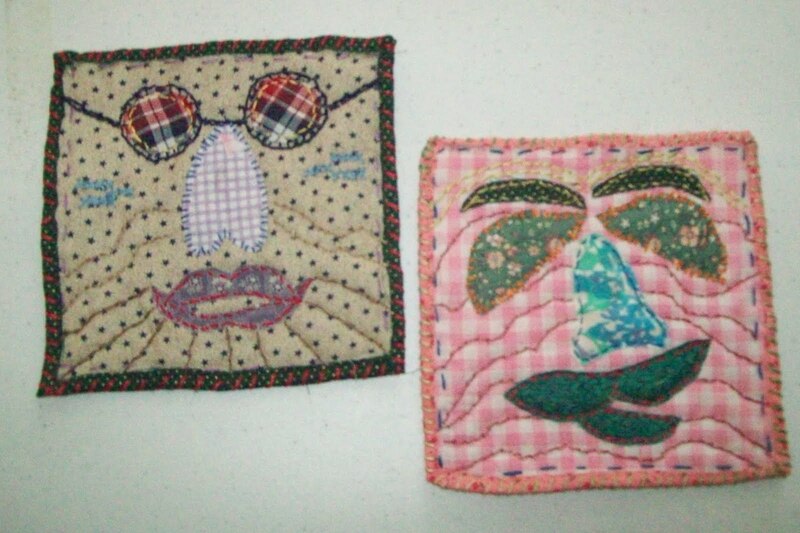 I've started calling my little faces Padillies and I'm thinking about making a quilted wall hanging with a set. Next week we are planning a short road trip over to Cape Kennedy to see the Space Shuttle Launch and this would be a great time to work on hand stitching. It's probably a 12 hour drive over, then back ... plus time sitting around waiting for the launch. So, in preparation, I started putting together 12 sandwich sets. I'm just going to secure the edges (machine stitch) instead of the binding overlap and will decide how to put them together for the wall piece after they are finished. Those are so cool! Looks like a great solution for scraps of fabric. BTW, enjoy the shuttle launch. If you haven't yet been, you'll never forget it. I'm trying to get hubby to catch one before it's all over, but he's so darned stubborn about staying home now that school's over.